Carla French, 39, of Jameson Close, St Leonards, pleaded guilty to causing unnecessary suffering to a male brindle and white Staffordshire bull terrier by failing to provide proper and necessary veterinary care and attention for a tail injury. The offence took place at St Leonards between July 2 and July 7. She was fined £80 and ordered to pay £300 in prosecution costs. Magistrates banned her from keeping an animal for seven years, recording that the reason was ‘an inability to care for animals’. 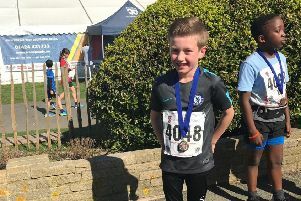 Big hearted eight year old helps homeless by taking on Hastings Half Marathon Mini Run.